Jung and Phenomenology is a classic text in the field of Jungian scholarship. Originally published in 1991, it continues to be essential to conversations regarding the foundations of Jungian thought. This Classic Edition of the book includes a brand new introduction by the author. Jung described his own approach as phenomenological, particularly as it contrasted with Freud’s psychoanalysis and with medical psychiatry. However, Jung’s understanding of phenomenology was inconsistent, and he writes with an epistemological eclecticism which leaves him often at cross purposes with himself. 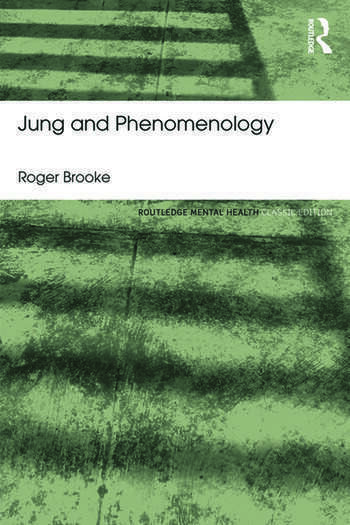 In Jung and Phenomenology, Brooke systematically addresses the central ideas of Jung’s thought. The major developments in the post-Jungian tradition are extensively integrated into the conversation, as are clinical issues, meaning that the book marks a synthesis of insights in the contemporary Jungian field. His reading and interpretation of Jung are guided by the question of what it is that Jung is trying to show but which tends to be obscured by his formulations. Examining the meaning of Jung’s theoretical ideas in concrete existential terms, Jung and Phenomenology is essential reading for psychoanalysts, psychologists and students interested in the Jungian tradition and existential phenomenology. Foreword. Preface to the Classic Edition. Preface to the 1991 Edition. 1. Towards a Phenomenological Analytical Psychology 2. Overview of Jung's Psychology 3. Jung's Method in the Light of Phenomenology. 4. A Critical Discussion of Jung's Experience in Africa 5. Psyche, and the Structure of Experience 6. The Self and Individuation 7. Conscious and Unconscious 8. Archetypes 9. A Clinical Study 10. An Integration of Themes. Notes. Roger Brooke is Professor of Psychology at Duquesne University, USA, where he has also been Director of Clinical Training. His theoretical and clinical work draws deeply from the Jungian, psychoanalytic, and phenomenological traditions. He is also the editor of Pathways into the Jungian World (Routledge, 1999).